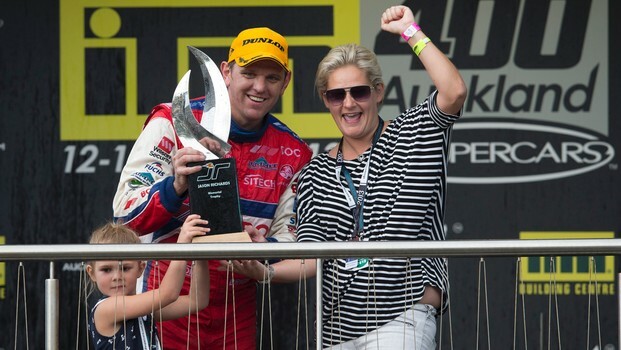 Jason Bright has taken the Jason RichardsMemorial Trophy home to Brad Jones Racing after winning the fourth and finalrace of the ITM 400 Auckland. The Holden driver Bright blitzed the field to score the emotional win. The emphatic triumph meant he claimed the Jason Richards Memorial Trophy as the best overall driver at this weekend's meeting at Pukekohe Park Raceway. 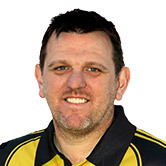 The trophy is named in honour of the Kiwi V8 driver who died from cancer in 2011 and Bright – a close friend and former teammate of Richards at BJR – was choked with emotion after stepping out of his Commodore. While the victorywas meaningful, it was a special celebration as Bright hoisted Richards'daughter Sienna in his arms and hugged Richards' wife Charlotte who presentedhim with the Jason Richards Trophy. "I got amessage from Charlotte during the week passed on from Sienna saying that shewanted to present the trophy to me this weekend – talk about putting thepressure on," Bright said. "I think it sums it up. Car 8 wanted to winthis race, the whole team wanted to take that trophy back to Albury. I wasawake last night thinking about it. "Yesterday when I got tagged by JamesCourtney, I think he (Jason Richards) jumped in the car and saved that one forme because there was no way I was going to save that one. "All I thought about this weekend and allthe team thought about was that trophy so it's very special." He even carried the "JR Star"signwritten on his car throughout the weekend. It marked another strong weekend for Brad JonesRacing, following Fabian Coulthard's win last weekend in Tasmania with the NewZealander now fifth in the championships, just ahead of Bright. The 40-year old beat home Holden Racing Team's Garth Tander by 5.299sec and Red Bull Racing's Jamie Whincup to make it a Holden clean sweep on the podium. In fourth was Fabian Coulthard while Will Davison finished fifth to jump ahead of Whincup in the championship by 31 points. Bright's victory meant there were four different winners in the four races over the weekend with Davison, Whincup and Scott McLaughlin also saluting. Earlier in the day, Davison scored a rare win for Ford at Pukekohe with victory in race three. In an anti-climactic finish to a chaotic race, Davison took the chequered flag ahead of New Zealand's Holden drivers Shane van Gisbergen and Coulthard. The safety car exited the track just 700m from the finish line after New Zealand teenager McLaughlin had put his Commodore VF into a wall. That left an easy passage to the line for Davison, who started from fifth spot on the grid, to claim just the second win for a Ford driver in 24 attempts at Pukekohe. Davison's Ford Performance Racing teammate Mark Winterbottom and pole-sitter Whincup had a running battle that resulted in them struggling home in 23rd and 24th respectively. The 19-year old McLaughlin came crashing back down to earth after his record-setting feat a day earlier. McLaughlin made V8 Supercars history when he became the youngest winner with victory in the opening race of the event. But on Sunday he failed to finish race one after putting his Commodore into a wall and the damage to his car significant enough to rule out a start in the final race.